Schwarzlose is a name that most will associate with the M1907 medium machine gun that the Austro-Hungarian army used in World War I. But there’s another Schwarzlose gun. In 1898, Andreas Wilhelm Schwarzlose completed a truly advanced pistol design that was well ahead of its contemporaries in design and ergonomics. Schwarzlose was Prussian. As a young man he served as a gunner and armorer in the Austro-Hungarian army before training at the National Ordnance College and setting up his own company, A.W. Schwarzlose G.m.b.H., in Berlin in 1897. Schwarzlose filed his first patent for the design in Britain in 1898 and got his U.S. patent in 1902 as production in Berlin was just beginning. 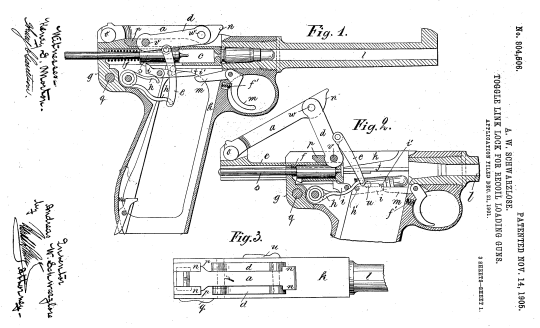 The design evolved between the two patents, with the first showing a small bolt handle on the left-hand side of the bolt — a feature Schwarzlose later replaced with a T-bar charging-handle. Additionally, the early patent describes an accelerator which, in theory, would have ensured that the action cycled. However, the 7.63-by-25-millimeter Mauser ammunition that the pistol used proved to be more than powerful enough to cycle without an accelerator — and Schwarzlose removed this design element by the time of the second patent in January 1898. Schwarzlose meant his M1898 — sometimes called the “Standard” or “Standart” — to be purely a pistol and not a pistol-carbine like many of its contemporaries, including the C-96 Mauser. As such, there was no provision for one of the holster stocks that were popular at the time. There are at least two extant examples of the pistol with a slot cut in the back strap to fit a holster stock, but this was not present on the majority of the guns. The pistol’s grip angle was highly ergonomic, making it very pointable. Another aspect of the design that was very advanced for the time was its controls. The M1898 had both a slide release lever to the rear of the receiver — the pistol locked open upon emptying the magazine — and a safety that could be thumb-operated, with down being safe and up being fire. Unlike rival pistols, the controls were accessible without the firer altering his grip. The pistol had an overly-complex sight — which was typical of the period. It rotated for graduations from 100 meters to 500 meters. The gun fed from a seven-round box magazine loaded into the grip, and fired Mauser’s 7.63-by-25-millimeter round. It was striker-fired and used a short recoil system with a four-lug rotating bolt locking the action. This was unlocked by the barrel-and-bolt assembly’s recoil as it traveled rearward, with the bolt being cammed by a stud in the wall of the frame. Another modern feature of the pistol was that its main spring acted as a recoil spring, a striker spring and an extractor spring. There was also an additional “barrel spring” that arrested some of the barrel’s rearward motion, absorbing much of the energy. The pistol’s primary design shortcoming was that, if the pin or loop holding the bolt in place sheared, the bolt assembly and barrel could — in theory — slide off the frame under recoil and smack the operator. Ouch. The M1898 was an extremely elegant design for the period. However, manufacturing it must have been prohibitively expensive. The construction of the pistol would have required highly-skilled machining. The bolt, for example, was milled as a single piece. As a result, fewer than 1,000 of the guns were ever made, and today only serial numbers below 500 are common. The Boers purchased a few during the Second Anglo-Boer War. However, commercial and military interest was minimal — and DWM’s Luger soon totally overtook it. Schwarzlose apparently sold the remaining pistols to Russian socialist — not Communist — revolutionaries in 1904 or 1905 for their planned revolution. However, authorities intercepted the shipment and reportedly issued the guns they confiscated to customs officers and border guards. While the Model 1898 proved to be a commercial failure, Schwarzlose continued to develop his pistol designs, next turning to a toggle-locked design he called the Model 1900. This, too, failed to find traction. However, his work with toggle-locks would bear fruit with the M1907 machine gun. Undeniably advanced for its day, Schwarzlose’s M1898 was the victim of its complexity and elegance and its maker’s limited resources compared to Mauser and DWM. Schwarzlose’s company continued to manufacture firearms until 1919, when the Allied Disarmament Commission closed the factory. Schwarzlose then worked as a freelance firearms consultant until he died in 1936 at the age of 69.